IHOP is now IHOb, for a limited time only. But its CMO says not to expect a sequel to the blockbuster campaign. GLENDALE, CA: IHOP CMO Brad Haley is a fan of the "crazy and bizarre." It’s why he’s taken his son to San Diego Comic-Con International for 16 of the last 20 years. It might also be why he gave the go-ahead to change IHOP’s name to IHOb. The "b" in IHOb stands for burgers, and the name change is part of a campaign to promote the pancake chain’s new grilled offerings. IHOP, which is celebrating its 60th birthday this year, has made other attempts to promote its lunch and dinner offerings, but they all fell flat as a pancake, noted Haley. The chain has included lunch and dinner offerings such as burgers and sandwiches on its menu since its founding, but few people have seen the restaurant as anything other than a breakfast stop. "The brand didn’t pursue it in a very concerted, aggressive, or interesting manner," he said. "The IHOb campaign was deliberately designed to be disruptive because we had to change paradigms in people’s heads." Even the brand’s pre-campaign research confirmed its reputation as just a breakfast joint. In the days leading up to the big reveal, IHOP ran a teaser campaign asking what people thought the "b"’ in IHOb represents. It found that few respondents associated the brand with anything other than breakfast, with most answers citing brunch, biscuits, and bacon. IHOP president Darren Rebelez, to whom Haley reports, had the final call on the extreme makeover, and he made the call with no hesitation. "[Rebelez] realized we had to crack the code by being disruptive and getting people’s attention," Haley said. When he stepped into IHOP’s CMO role last August, Haley’s first priority was to rejuvenate the brand’s image. IHOP’s marketing had been stale for so long that its relevance was starting to wane, he said. 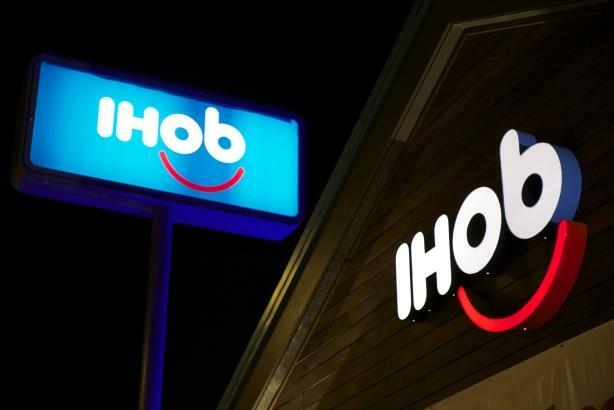 The seed for the IHOb idea was planted last November, when the chain held a creative review. The eventual winner, Droga5, and other agencies participating in the pitch were asked to promote a non-pancake dish from IHOP’s menu. "To maximize our full sales and traffic potential, we couldn’t only talk about pancakes; we had to talk about our other offerings," said Haley. Droga5 presented the first idea for IHOb, which evolved into the campaign the chain revealed this month. When the agency came on-board, it went through consumer insights with the chain. "People see the brand as a fun, quirky place where everyone is welcome and you can come as you are, but that wasn’t being played back in the brand’s comms," said Haley. The chain has worked with Droga5 to ensure its marketing is more "entertaining, engaging, and quirky" to reflect how people view the brand. It also created a new brand purpose in concert with the quirky theme, which Haley defined as "giving all folks a place to pancake together." The chain is using "pancake" as a verb because it "represents more than just the physical pancake: it includes all the wonderful, warm emotions and good feelings people have when they think about and eat pancakes," Haley said. Droga5 also developed IHOP’s tagline: "pancakes, pancakes, pancakes." But what if customers were confused by an emphasis on burgers as well as pancakes? Asked if he was afraid the pancake message would be lost in the temporary burger rebrand, Haley said IHOP has a real-time social media community management team, led by MRM McCann, working to dispel the notion that the restaurant no longer serves pancakes. "Anytime we see a comment that asks, ‘Why have you stopped selling pancakes?’ or ‘What are you doing to my IHOP?,’ we say, ‘Don’t worry, the pancakes aren’t going anywhere,’" said Haley. Not every customer thinks the rebrand is clever. Some have pushed back on social media to say the restaurant should keep the "P." In response, IHOP is reminding fans that it isn’t really changing its name and although IHOb branding is on menus and posters, it’s only a three-month campaign to promote hamburgers. When it ends, the chain will return to "good old IHOP again," said Haley. The chain is also planning similar campaigns to promote other, non-breakfast menu items. IHOP could make other periodic pushes – once or twice a year – to remind people they can also have lunch and dinner offerings. Should fans of the brand be ready for another rebranding to something like IHOs, promoting sandwiches? Haley isn’t ready for a repeat performance. "I think we happened to catch lightning in a bottle this time around, so any attempts to do something similar in the future would just be viewed as derivative," explained Haley. "We’ll just have to come up with something that is equally fun but completely different. No pressure." Since the launch of the teaser campaign on June 4, the IHOb push has been featured in more than 15,000 earned media stories. The total potential reach of social media conversation has hit 3.4 billion people, with 1.2 million tweets. That is a 7,000,000% increase from the previous week’s conversation volume, with 92% of the conversation taking place on Twitter, according to DeVries Global, IHOP’s PR agency partner. Consumers are sharing IHOP’s earned media stories across their own social channels. During the tease phase from June 4-10, IHOP saw an average of 23 shares per earned media story. This increased to an average of 92 shares per story after Monday’s "burger" reveal. Instagram posts from both paid and earned influencers who attended the IHOb launch events reached more than 8.1 million followers in the two days after the name was unveiled. On Monday, the brand saw 432,000 visits to ihop.com. The site typically averages 80,000 a day, meaning a 440% increase or 5.4 times higher than the daily average. Major brands roasted IHOP over the name change, and celebrities engaged with the brand on social media, helping the brand in its quest to remain relevant. "That helped propel this brand from where it was viewed as a stodgy, 60-year-old brand to a brand people want to spend more time with and engage with because it’s more fun and contemporary than they had expected or remembered," said Haley. He attributed IHOb’s success to the gamification aspect of the campaign, with the brand asking people to guess what the "b" stood for. "We had reports of offices having pools to guess what the ‘b’ could be; radio stations held contests," he said. "People clearly got into it in a big way and had fun with it as we had hoped. That fed on itself, more people got involved, and then the media picked it up organically." The next step for the IHOb campaign: getting out the quality message. "We want to make sure when people have our burgers, they aren’t just pleasantly surprised, but shocked IHOP can make a burger this good," said Haley. IHOP's name change to IHOb: Confusing or flipping brilliant?